Why has political ecology been assigned so little attention in tourism studies, despite its broad and critical interrogation of environment and politics? 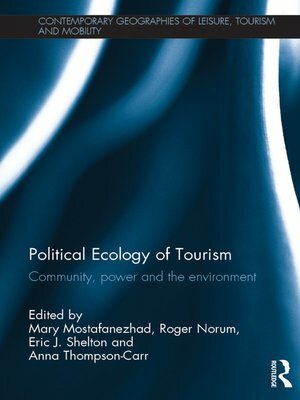 As the first full-length treatment of a political ecology of tourism, the collection addresses this lacuna and calls for the further establishment of this emerging interdisciplinary subfield. Drawing on recent trends in geography, anthropology, and environmental and tourism studies, Political Ecology of Tourism: Communities, Power and the Environment employs a political ecology approach to the analysis of tourism through three interrelated themes: Communities and Power, Conservation and Control, and Development and Conflict. While geographically broad in scope—with chapters that span Central and South America to Africa, and South, Southeast, and East Asia to Europe and Greenland—the collection illustrates how tourism-related environmental challenges are shared across prodigious geographical distances, while also attending to the nuanced ways they materialize in local contexts and therefore demand the historically situated, place-based and multi-scalar approach of political ecology. This collection advances our understanding of the role of political, economic and environmental concerns in tourism practice. It offers readers a political ecology framework from which to address tourism-related issues and themes such as development, identity politics, environmental subjectivities, environmental degradation, land and resources conflict, and indigenous ecologies. Finally, the collection is bookended by a pair of essays from two of the most distinguished scholars working in the subfield: Rosaleen Duffy (foreword) and James Igoe (afterword).